While the details of the Lone Ranger's origins have changed between the various adaptations, the general outline is as follows. A Texas Ranger named "Reid" is the Sole Survivor of an ambush that kills the band of Rangers he'd been riding with, including his brother Dan Reid. Left for dead, Reid is found by Tonto, who happens to have had his life saved by the Ranger in the past after renegades wiped out Tonto's home village. A chance remark by Tonto gives Reid the name "Lone Ranger." The Lone Ranger dons a mask, initially to prevent the criminals from finding out which of the Rangers had survived and targeting their family. At some point, the Lone Ranger acquires the services of Silver. He also convinces a retired Ranger to be his agent, working a secret silver mine that supplies the Lone Ranger's silver bullets and otherwise modest needs. Finally, the Lone Ranger and Tonto are able to capture the criminals responsible for the ambush and bring them to justice. The Lone Ranger was noted for his unusually strong moral and ethical code. He used his silver bullets ("reminders of the preciousness of life") to disarm opponents, not to kill. The radio and early TV series were careful to keep the Ranger's abilities somewhat plausible--yes, he could outdraw any single opponent, but had to be more clever to deal with multiple attackers. And while Tonto's devotion to the masked man sometimes had Unfortunate Implications, the Lone Ranger never treated his faithful companion as anything less than a human being and full partner. As it stands, the series still had to be updated as sensibilities changed by the 1980s. Most notably, Tonto began to speak in perfect English as a proud warrior who will not tolerate being mistreated. The most recent Lone Ranger revival came in the form of Dynamite Comics' new publication. The series is notable for its darker tone and occasionally graphic depiction of violence. This incarnation included a detailed version of the Lone Ranger's backstory. Tonto is characterized as a forlorn wanderer outcast from his tribe, who is more willing to use lethal violence than the Ranger. The Ranger also has a darker portrayal, and has hopped on the Sliding Scale of Anti-Heroes. Readers expect him to shout, "I'm the goddamn Batman!" any day now. A new The Lone Ranger movie is currently in preproduction. Johnny Depp has been cast as Tonto, but few details are available. After Cowboys and Aliens bombed, though, the project was ultimately pushed back from December 2012 to May 2013. Interestingly, shortly after this was announced, early reports said that the film would have featured supernatural elements involving werewolves. . . Animated Series: Done by Filmation, with all that that implies: generally cheap-looking animation combined with very good writing, artwork, voice acting, and music. While their original productions varied a great deal in quality, Filmation always did a conscientious job with their shows based on established classic adventure heroes. And then there's the 1966 Format Films version, which was surprisingly good, averted several cliches (death was menctioned even in the opening itself, which by the way, was absolutely epic. Bilingual Bonus: "Tonto" is Spanish for "fool". Which is why he was renamed "Toro" (Bull) in Spanish translations. That Other Wiki says the name was taken from the Tonto Basin in Arizona. The NPR was appalled when accusations of racism appeared years later, claiming to be unaware that the word meant that. 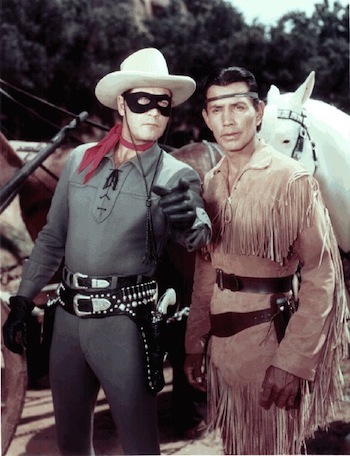 In fact, as played by Jay Silverheels (Mohawk), whose "Hmmmm..." spoke volumes, one had the distinct impression that Tonto was smarter than the Lone Ranger. The word "kemosabe" comes from a tribal language, meaning "trusted friend." The name "Tonto" is attributed to the same language, meaning "wild one." Canon Discontinuity: The Republic serials are ignored, although the full-face mask is sometimes used for a Lawyer-Friendly Cameo in The Green Hornet. The Cape (trope): Or at least the Western equivalent. Catch Phrase: "Hi-Yo, Silver, away!" Celibate Hero: The Lone Ranger has no time for romance, and neither does Tonto. This was actually written into the show's "bible" back in the earliest days. Cool Horse: Silver, and to a lesser extent, Tonto's horse Scout. Cool Mask: One of the codifiers for smaller eye ring types. Comic Book Adaptation: A few over the years, including a recent series from Dynamite Comics, taking The Lone Ranger & Tonto down a Darker and Grittier path. Executive Meddling: Disney delayed production on their movie after the underperformance of Cowboys and Aliens. When Jack Wrather bought the rights to the property in 1978, he sued Clayton Moore to stop him from appearing in public as the character, hoping to establish a new actor in the role for an upcoming movie. It ended up being an enormous PR disaster resulting in a successful countersuit. The Faceless: Once having assumed his new identity, the Lone Ranger is never seen without his mask or some form of disguise. Actor Clayton Moore carried this through in his public appearances as the Ranger for years afterward, even after being harassed by ITC in an ultimately fatal PR disaster. When he wasn't allowed to wear the mask, he wore big sunglasses. Frothy Mugs of Water: The radio and TV series avoided even the mention of alcohol, causing villains to have to gather in "cafes" instead of the usual saloons. Again, this was specified in the writer's guide. Improbable Aiming Skills: How the Lone Ranger avoided ever having to kill anyone. No Name Given: "Reid's" given name is never mentioned in the radio or TV series, though some ancillary material indicates it may be "John." No Problem With Licensed Games: The NES game version of The Lone Ranger, while not a well known game, is considered a Cult Classic by the few who played it. Once an Episode: The radio drama's penchant for having Tonto sent to town to get information and getting the snot beaten out of him by the bandits was famous enough to become a Bill Cosby routine. Bill Cosby: Now Tonto, to me, always was like -- I would say to Tonto, why does he do the same thing, because the Lone Ranger would always say, "Tonto?" "Yes, Kemosabe?" "I want you to go to town." And every time he'd go to town, the bandits would beat the snot out of him! No, they'd get him! *BAM! BAM! * "Nice to have you in town, Tonto!" *BAM! BAM! * That kind of thing. And he'd go back and the Lone Ranger'd look at him, "Oh, my, goodness, Tonto. Did you get the information?" "Yes, me have information, Kemosabe..." And I'd always holler at the radio, "Tonto! Don't go to town! They're gonna beat you up again, man!" Beemer's voice was deeper and richer than Graser's, suggesting that the Ranger had got his Heroic Second Wind. Additionally, Clayton Moore was temporarily replaced on the TV Series by John Hart due to dispute over salary or creative differences. Outlaw Town: The TV series had an episode titled "Outlaw Town". Phrase Catcher: "Look! He left this Silver Bullet!" "Who was that masked man?" Popcultural Osmosis: The theme song ("William Tell Overture") was originally written in 1829 as part of Rossini's opera William Tell, but today it is inextricably linked to the show. Rage Breaking Point: The Lone Ranger occasionally lost his temper, but good. He once delivered a terrific beating to a mangy owlhoot who had blown his cover, a disguise on which many people's lives depended. Then he forced the guy to lick his boots. At gunpoint. Honestly. Spaghetti Western: The main influence on the Dynamite Comics series. Spin-Off: Sort of; The Green Hornet, created by the same people, was the Lone Ranger's grand-nephew Dan Reid. Thou Shalt Not Kill: The Lone Ranger is very clear on this. You No Take Candle: Tonto talked like this until the '80s. Word of God had it that he actually spoke several languages, just had trouble with pronouns in English. You Sound Familiar: Before taking over for Earle Graser, Brace Beemer served as the show's announcer. He also played the Ranger in public appearances, as his 6-foot-3 frame and expert horse riding skills made him feel more like the Ranger than the shorter, mustachioed Graser. This page was last edited on 8 May 2017, at 15:56.